Dear St Ignatius, while suffering the pain of a broken leg and waiting to recover your health, you began to think seriously about life. Then you began to discover what it is that brings true peace and joy to the human heart. You discovered that it is in the teachings of Jesus, His example of life and in the manner of living of the saints that we are able to find joy and peace. I also am looking for peace and joy in my life. Ask God to help me discover what His will is for me in order to have peace and joy in my life. Ask God to help me walk on the road of Jesus and find there the happiness my heart desires. - Think over this prayer. Ask for the grace you desire. – If possible, read John 10:10. St Ignatius of Loyola, pray for us. Together with St Ignatius of Loyola, we ask you, Lord, that all our thoughts and actions, desires and all our being and doing be purely directed to Your greater glory and to the service of our brothers and sisters. Amen. Dear St Ignatius, you experienced a strong desire to imitate the example of the lives of the saints. You did penance for your sins, like the saints did. You asked for God’s forgiveness, trusting in His great mercy. Ask God to help me to do penance for my sins. Ask God to help me trust in His mercy and never fall into despair. St Ignatius, pray for us. – If possible, read Luke 18:9-14. Dear St Ignatius, during your search for peace and joy, you obtained from God the grace to pray a lot and to live in great union with God. I also feel inside me the thirst for peace and joy that God, my Creator, placed in my heart. Ask God to teach me the art of prayer. Ask for the grace to live united with God on the road of Jesus and to be able to spend some time praying every day. – If possible, read Luke 11:9-13. Dear St Ignatius, you understood that we are created to serve God, to love Him with all our heart and to love our neighbour as ourselves. You discovered that everything that exists in the world was created to help us fulfil these two commandments of love. Ask God that I may obtain the grace to know how to treat people and the things of this world in such a way that I may always grow in the love of God and neighbour. – If possible, read Mark 12:28-31. Dear St Ignatius, we know that you felt great joy in adoring the Most Holy Trinity. We know that you believed in God as a community of three Divine Persons, Father, Son and Holy Spirit, who are always working for the good of humanity. Ask God that I may obtain the grace of understanding that God is a community of Divine Persons who work together for our salvation. Obtain from God the grace for me to live in community with my brothers and sisters. Ask that the communities of the Church may know how to work for the salvation of the world and for the liberation of all the people. – If possible, read John 5:17. 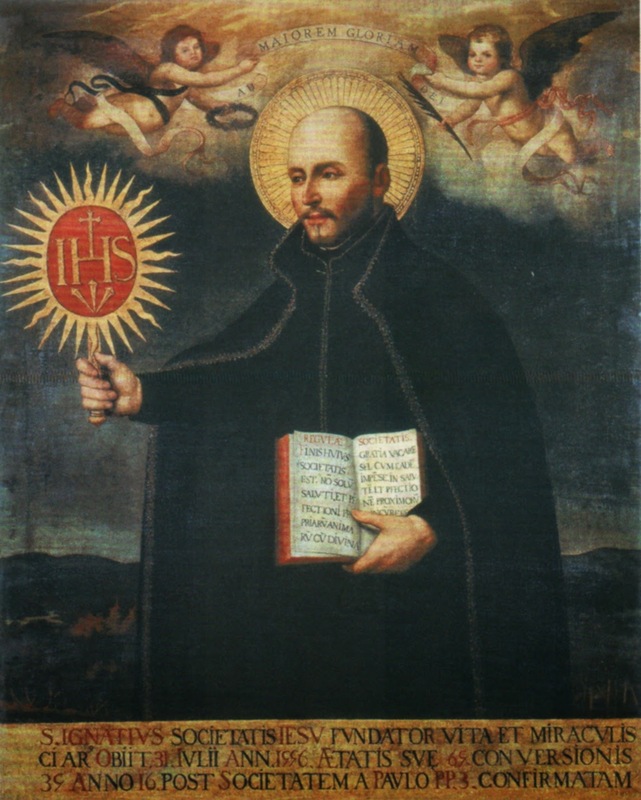 Dear St Ignatius, you had a great knowledge of Jesus Christ and you were a personal friend of His. You realised that God the Father called you to be a collaborator in the work of Jesus, His Son, and in the service of the salvation of the world. Ask God to give me the grace to know well Jesus Christ and to become His companion in the work of evangelizing the persons in His life of society. – If possible, read Matthew 11:27. – Say a spontaneous prayer to Jesus Christ. Dear St Ignatius, contemplating the life of Jesus, you received the grace of understanding in practice what it means to firmly follow Christ, poor and humble, on the road to God in spite of persecution. You understood that the ambition of riches and the desire of having honours leads to pride. Ask God to help me understand this also so that I may have a poor, meek and humble heart to love God and neighbour. – If possible, read Matthew 11:29. Dear St Ignatius, many times you contemplated the glory of the risen Jesus and rejoiced with His victory over death and sin. This strengthened your life of faith. Ask God to grant me the grace to rejoice with His risen and victorious Son. Increase in all Christians hope for the complete liberation that God promised His people. – If possible, read John 20:19-20.